A very good USA-made Jazz Bass with subtle upgrades and clear, clean delivery. Clarity of sound. Distinctive tones. The American Special has been gently tweaked to refine the Jazz formula. Open-gear 'shamrock' tuners feature on the traditional Jazz bass. Fender's fine-tuning has left the classic good looks and comfortable fit intact. Although the Precision was the first electric bass guitar designed by Leo Fender, for many it was his second bass design that fully captured the imagination. Originally publicised as the 'two-pickup Precision' it was in fact everything but. Compared to the Precision's split-coil pickup, the matched pair of single-coils on the Jazz seemed rather narrow and, with an offset body and an ultra-slim neck (which was supposed to appeal to guitarists), the Jazz looked and felt entirely different to its predecessor. And just as importantly, it sounded very different too. "The warm and rich bottom end is supplemented by clear overtones that ensure excellent note definition - it really sings as you work your way up the neck." 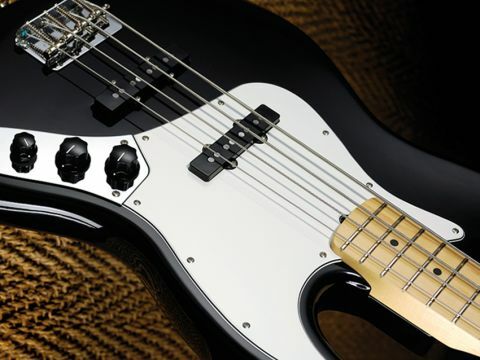 Few players today are unaware of the magical properties that two identical pickups produce on a bass as they are gradually blended together, and that has become the main attraction of the Jazz for many a bassist. But there is also something special about the overall proportions of the instrument that give it a highly specialised feel, and it's important that this element is maintained in all variations of this model. Let's be honest, there was precious little wrong with the Jazz Bass from its inception, and with that in mind we really don't want anything too radically different here. That said, over 50 years the odd tweak, a little tampering and a touch of fine-tuning doesn't go amiss, and Fender is expert at this sort of thing. First impressions are certainly good. The classic looks are intact and you're presented with an instrument of good weight, balance and a comfy fit to the body. It features a white scratchplate on a black body with an all-maple neck, so it's certainly striking to look at. It also boasts a slimmer-than-Precision neck profile, but to our hands, it just feels particularly well-proportioned and nicely finished as opposed to anything radically different. The beauty of the Jazz design is its highly versatile range of sounds, which can suit, shape or define a multitude of musical genres. Now fitted with Fender's Greasebucket tone circuit, which rolls off the high end while maintaining low-end definition - the range and delivery should be even more dynamic than usual - and in practice it is. To our ears, this latest Jazz offers a generally cleaner and more defined sound. The warm and rich bottom end is supplemented by clear overtones that ensure excellent note definition - it really sings as you work your way up the neck, particularly on those upper strings. Blending the individual pickup sounds with the independent volume controls still offers the best way to mix them, and as with all passive circuitry the volume control itself plays a part in the tone. It's subtle, but then finding those sweet spots is always the fun part of getting to know a Jazz. That said, back off the tone, focus on either pickup and dig in, and there's grunt and rasp aplenty on the lower strings - a great sound that the Greasebucket really exploits to the max. This is a fine Fender bass, with its own identity and sound. The Jazz proves to be a fine example of its pedigree, sticking to its traditional roots.